The Institute of Multilingualism was founded in 2008 as a joint institute of the University of Fribourg and the University of Teacher Education, Fribourg. Its activities include carrying out research projects in the area of multilingualism, supporting teaching at all levels of higher education (Bachelor, Masters, Doctoral, continuing education), collaborating with various stakeholders on a regional, national as well as international level, sharing knowledge gained with the world of science and the general public, carrying out academic events, managing services and information. The Institute of Multilingualism is committed to researching multilingualism and its linguistic, social, political, economic and educational aspects. Major areas of research include multilingualism in education, human migration and the workplace as well as the evaluation of language competence. The Institute of Multilingualism pursues its own research projects and participates in national and international projects. In addition, the Institute assumes external mandates in research and development. University of Teacher Education, Fribourg: teaching and research unit “Inegality, Diversity and Educational Institutions"
The Institute of Multilingualism is interconnected to a number of partner institutions and works closely with other Swiss and foreign universities. 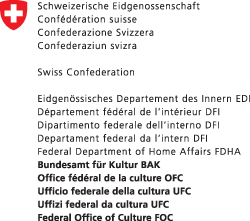 The Institute of Multilingualism is financed in large by the Adolphe Merkle Foundation and the Foundation for Research and Development of Multilingualism of the Canton of Fribourg. On 4 June 2010, the Federal Council has adopted the by-law on national languages. At this occasion, the Institute of Multilingualism Fribourg has been nominated as the national Research Centre on Multilingualism. The Institute’s board of directors is very pleased about the decision and is honored to assume this responsibility. The Federal Office of culture (German and French) and the Institute of Multilingualism have concluded a contract on the tasks and activities of the Research Centre. Within the scope of the swissuniversities programme “Development of academic skills in subject-specific didactics” 2017-2020, financed by the Swiss Confederation, the PH | HEP FR and the Institute of Multilingualism act as leading house of the Centre for Foreign Language Didactics (CeDiLE). One of the project’s objectives is the promotion of young researchers in the domain of foreign language didactics. Therefore, two PhD candidates were recruited to empirically examine important issues in foreign language didactics that are still under-researched. In addition, a scientific collaborator was recruited to further develop the CeDiLE and the intersection between scholarship and professional practice. In particular, research results of the Institute of Multilingualism will be disseminated among a variety of parties, such as subject-specific teaching professionals in order for them to both benefit from research results and provide feedback in order to evoke further research questions. The CeFoLD also aims at strengthening the master’s degree programme in foreign language didactics at the University of Fribourg and to participate in establishing the Centre de compétences romand de didactique disciplinaire (2Cr2D), which, inter alia, includes the establishment of a network of researchers in French-speaking Switzerland. Both the master’s degree programme and the participation in the 2Cr2D are a joint responsibility of the PH | HEP FR and the University of Fribourg.